What is Denplan excel and how it benefits you as a patient? We are registered with the general dental council (GDC) and the care quality commission (cqc) who regulate and inspect dental practices. In addition to this we are Denplan excel certified. 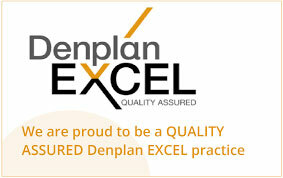 The Denplan excel certification programme is an additional mark of quality. It supports us as a practice to allow and encourage us to reach our full potential as providers of excellent care. To become accredited we show and demonstrate continued commitment to quality improvement. We pledge and use the most appropriate procedures and dental knowledge to ensure patients are receiving the highest standard of care. We also encourage patients to be involved in the decision making. We use a tool called DEPPA during examinations to allow a full oral health assessment. This allows the dentist to examine your current oral health status and identify any future risks. Denplan excel is an optional scheme but here at the Whitley dental clinic we feel it is very important to have such a scheme to allow us access to additional tools and support from Denplan. This allows and helps maintain excellent all round care.